Coming just three years after Hitchcock’s death, Donald Spoto’s biography was at the time the heftiest tome (both in size and scope) to focus on the life and career of Alfred Hitchcock. John Russell Taylor’s 1978 book was the only authorized biography of Hitchcock. Donald Spoto did approach the Hitchcock family in 1980 asking for their blessing, but was told by daughter Patricia that the family would not actively cooperate with any authors after her father’s death. That may be the best thing that could have happened to Spoto, for it freed him to explore some territory (the “dark side” of the title) that the family almost certainly would have objected to. Donald Spoto met Alfred Hitchcock in 1975, during the making of Family Plot. He had the opportunity to interview Hitchcock, as he prepared a book about Hitch’s films. The seed for the ultimate Hitchcock biography was almost certainly planted at this time. The one thing this book shares with the Taylor biography is a chronological narrative structure. 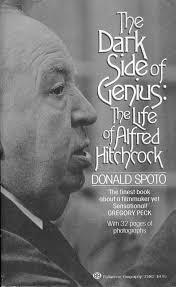 Spoto’s book doubles the earlier bio in length, and much of that extra detail is focused on the themes of Hitchcock’s films, and how they relate to his personal life. …it became clear that Hitchcock’s films were indeed his notebooks and journals and that his almost maniacal secrecy was a deliberate means of defelecting attention away from what those films really are: astonishingly personal documents. While there is considerable merit in Spoto’s auteur theory analysis of Hitchcock’s films, there is a danger in reading too much of the personal into the films’ narratives. This book reminded me at times of Stephen Greenblatt’s William Shakespeare biography Will in the World, which is at the forefront of the “new historicism” movement, an attempt to understand intellectual history through an interpretation of literary and artistic works. Many of the connections here are speculative; no matter how brilliant they may seem on paper, one can never know how much an artist is projecting his personal life upon his works, unless he expressly describes it. In Bernard Herrmann’s musical score…the lost world of California’s Spanish past is everywhere evoked. Memories and fragments of forgotten hopes float like lily pads in the score…The music and the sound effects are elusive and lonely, fragile and ghostly. What a perfect description of Herrmann’s brilliant contribution to this film. Spoto provided many details that had never been disclosed about Hitchcock’s movies. Such as the fact the the painting Anthony Perkins’ character Norman Bates pulls from the wall in Psycho, in order to spy on Janet Leigh’s Marion Crane, is a painting of Susanna and the elders, a biblical story detailing men spying on a woman as she prepares to bathe. Donald Spoto was also the first to expose the depth’s of Hitchcock’s obsession with his leading ladies, describing the times he crossed the line with Tippi Hedren. Spoto also describes a Hitchcock who descended into alcoholism and depression in his later years. While some found these episodes to be scandalous, they are an essential part of Hitchcock’s life and narrative. Spoto is not muckraking; clearly he has a fondness for his titular subject. While I do not consider this the definitive documentary on Alfred Hitchcock, it is an important work, both well-written and enlightening. It is a much deeper dive that the earlier authorized biography of Taylor, and therefore is highly recommended to fans of the master of suspense.